"People are accommodating. But you have to be fast before they lose their joy at meeting you," says Felver, 67, who lives in an old church that has been chopped into apartments on a Sausalito hillside. There is a view of the water, and in his fisherman's cap and weathered face he looks as though he just blew in from the sea. His voice is a high rasp and in conversation he rambles, like his pal Ramblin' Jack Elliott. Asked how he developed his photography style, he begins: "After I got out of college, I was in the Army, and then I went up to Alice's Restaurant in Stockbridge, Mass., and started playing guitar with everybody else." By the time his yarn drifts west, it is 1976, and he's in North Beach to find what was left of the Beats, which was "everybody except Kerouac and Cassady." He'd been to film school in London, where he made a 30-minute film about Cassady called "The Last Time I Saw Neal," though he'd never met him. Once in San Francisco, he expanded to hour-long documentaries for KQED - "Archive of the Living Culture," which aired in 1982, and "West Coast: Beat & Beyond" in '83. He fancied himself "in the Robert Frank tradition," working in both moving and still pictures, black-and-white in both cases. "I was always picking away at everybody who is in the culture," he says. "I sort of take on a group and just beat it to death." By the time he'd beaten the Beats to death, he had a portfolio of 1,400 "poet traits," as he calls them. "All name brand people," he says, presuming you know the brands Bob Kaufman, Greg Corso, Neeli Cherkovski, Jack Hirschman, Harold Norris, Howard Hart and Philip Lamantia. He loaded their images up and headed east. "I was in New York for about an hour and got this book deal," he says, shuffling around to find a copy of "The Poet Exposed," published in 1986. He'd made portraits of musicians here and there, but had avoided trying it at concerts because "I could see how complicated it was with backstage passes and how you get in," he says. His attitude changed when a mutual friend introduced him to Clint Eastwood at the Monterey Jazz Festival in 2008. Eastwood gave him a backstage pass to shoot poet traits, and by the time the weekend was over, he had 30 pictures, which is a good yield for two days' work. He was quicker at Hardly Strictly Bluegrass. In one 10-minute stretch, he got Randy Newman and Elvis Costello right after their sets, and Patti Smith right before hers. 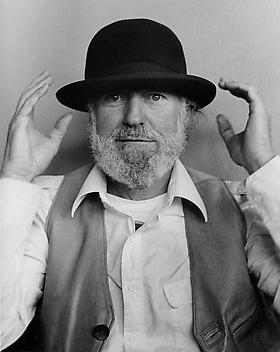 To finish out the book, he hit the New Orleans Jazz and Heritage Festival twice and the Corn Festival in Beacon, N.Y., once, to get his cover shot of Pete Seeger standing on a rock in the Hudson River. He is always looking for the hero shot, and his instructions are always the same: "For one second you've got to put those lips together and lay it on me," he'll say. "I don't want to get carried away. Diane Arbus used to take hours, and you couldn't get rid of her. I don't want that kind of a reputation, as being a drag." But he also doesn't want the reputation of being a head-shot artist. "My style comes out of a film background," says Felver, who now has eight photography books to go with eight films, most recently "Ferlinghetti: a Rebirth of Wonder," released in 2011. "People are talking right into the camera. It's not off to the side or somewhere else. This is classic stuff. This is Man Ray." American Jukebox: To watch a short video, go to www.sfgate.com/news/item/American-jukebox-29684.php.